I know this isn't Sunline related, but I could use some help. Our heating/cooling system at home has an old dial type mercury thermostat. It controls both heat and cool. 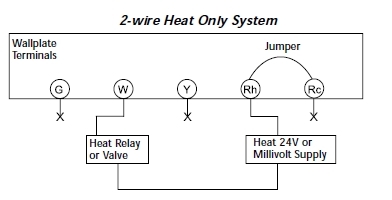 There are only two wires coming from the system. The system itself, has a heat/cool switch on the front of it. When it's time to switch over, I simply flip the switch and set the thermostat to the desired temperature. Ok... I answered my own question... Apparently, it works as a "Heat only" thermostat. Contacts closed and the heat comes on. Contacts open and it cools. Of course, it depends on how the unit's switch is set. The Hunter you have is a relay contact T stat. It should be able to work with your 2 wire setup. I just cannot remember if the contacts open for cooling or energize for cooling. Using your meter you can test between the Y and RC terminal and see if it opens or closes when the room temp is above the setpoint. Do you have it up and going? I had to figure this out my own self... I should have just downloaded the manual! It's up and running perfectly! I am sure this thread and the diagram picture will help the next person with the same question. It's up and running perfectly!